As a sommelier default cigar pairings by text book and execution were Cognac, Armagnac, Scotch, and fortified wines. This left out those sunny evening whites, wintery reds, celebratory bubbles, and post mains stickies, which can successfully pair well with a cigar. If we look at wine, especially table wine under 14% abv, and cigars there are similarities between these agricultural products that make pairings possible. Wines and cigars are the finished product of fermentation, and terroir, and the human hand. Habanos can be considered top tier of the cigar world. There are specific farms “vegas” within denominated regions of origin, rules governing the production, ageing, and marketing of cigars; and very much like the finest wines; hands on processes from farm to mouth. Cuba has four outstanding tobacco growing DO’s known as the “Vegas Finas de Primera”. Vuelta Ajajo is the finest region known for its outstanding soil and macroclimates along with Semi Vuelta, Partido, and Vuelta Arriba. Production of tobacco like wine has a series of calendar driven processes from seedling planting, leaf harvesting, two fermentations over the course of 70 days or more, sorting and classification, and the hand production of the finished product. Tobacco production like grape growing is heavily influenced by climate throughout its growing cycle “vintage”. Cigars are also influenced by shade and sun grown leaves – think cool verse warm climate grape flavours. A typical cigar is made from five leaves. Three leaves make up the flavour profile; “volado” leaf is light flavoured and very combustable, “seco” leaf is medium flavoured and contributes to the aromas, and the third leaf “ligero” is full flavoured and slow burning . The fourth leaf “capote” is the binder of the filler leaves and will define the final shape of the cigar. The final leaf “capa” is the wrapper, chosen for its flawless colouration and visual appeal. A well-made cigar is much like the Bordeaux cepage with various leaves blended for the perfect balance, flavour profile, and smoke-ability. What makes a successful marriage of cigars and table wines? Consider cigar size and flavour along with a wine’s fruit level, tannins, oak influence, and acidity. Cigars are measured in not only breadth but also length. Breadth or ring gauge is measured in sixty-fourths of an inch. 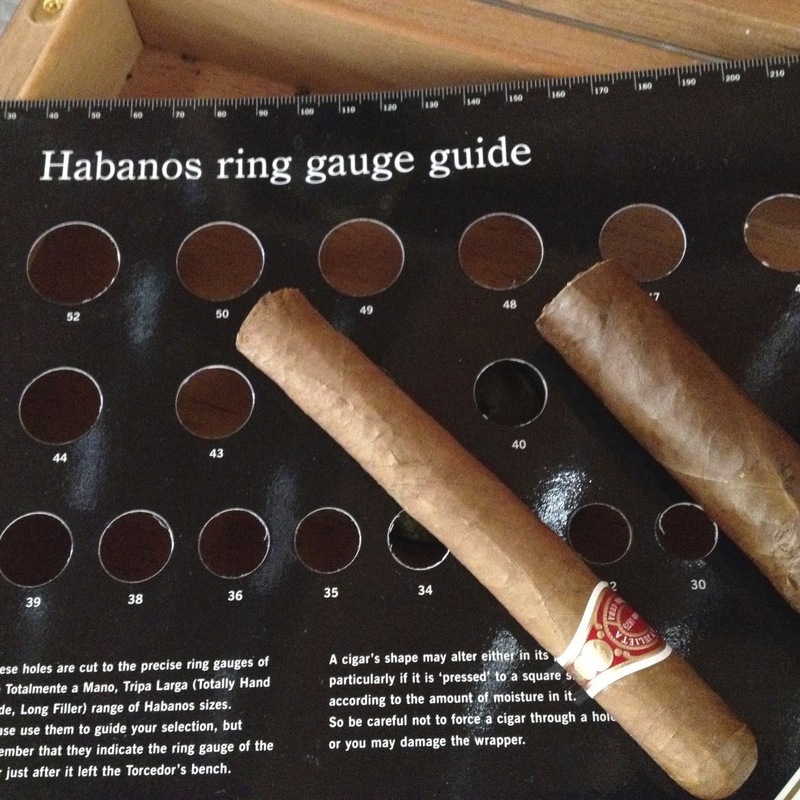 Slender cigars vary from 26th to 39th of an inch, standard cigars 40 to 44, and heavy ring gauges from 46 to 52. Cigar length varies from 4 to 7 ¼ inches. Size does not represent strength so you need to know your houses and their style. Be cognisant that size influences smoking time anywhere from thirty minutes to an hour and a half. As with wine and food pairing; acidity is a factor to consider. Wines are high in acidity compared to cigars that are alkaline in nature. The perfect pairing would be like that of Yuanyang “Hong Kong coffee milk tea”. Flavours are subjective in both wine and cigars, but most successful pairings are those with complementary flavours rather than contrasting flavours. Tannins and cigars are not the best of mates with wine tannins making cigar flavours appear harsher. White wines that are too heavily oaked can also have the same effect. I’ve found from numerous pairings that fruit forward soft reds are a cigars best pairing, along with off-dry to very sweet whites, whose honeyed notes highlight the flavours of cigars. The sweeter the wine the heavier and more flavourable cigar match is possible. Lighter cigars are great matches to new world Pinot Noir, Gamay, and Tempranillo. Pinot Noir’s elegant texture and soft tannins along cranberry, rhubarb, and smokey forest floor flavours are a perfect complementary style. Rioja’s Tempranillo mirrors many flavours of light to medium-bodied cigars with its raspberry, leafy, and cedar/vanilla/coconut notes from extended oak ageing. Reserva’s and Gran Reserva’s are beautiful complementary smoking reds. Gamay with its bright ripe fruit and soft tannins is a great bridge between light and full-bodied cigars. If you are a fan of "natural" wines or those with some VA or touch of brettanomyces these endear themselves to cigars. Tuscany's Sangiovese can work with light to medium cigars especially with a bit of bottle age. Bordeaux and Meritage style wines work perfectly fine with lighter cigars especially after five to ten years of ageing once the tannins soften and tertiary notes appear. Younger Cabernet is an interesting experience if the wine exhibits any of the classic chocolate box or minty flavours. Be aware of tannic Cabs. 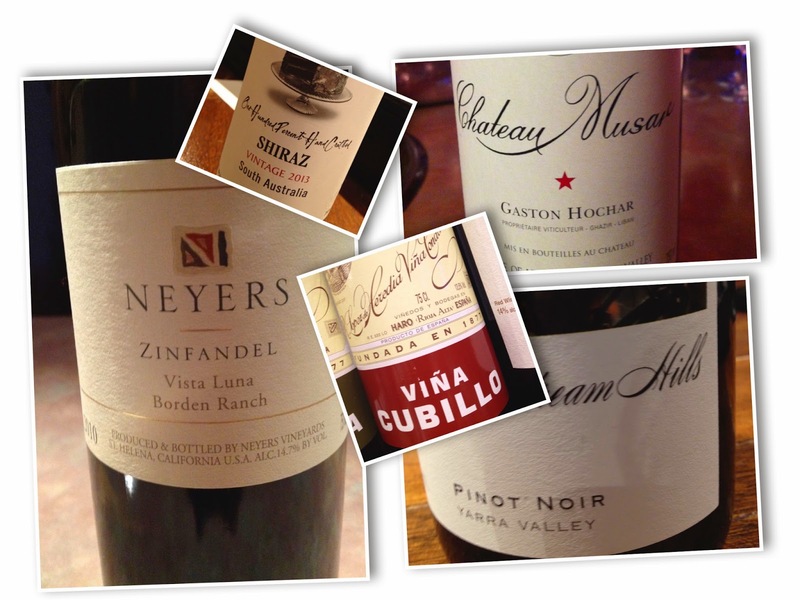 Medium-bodied cigars nicely pair with ripe juicy reds especially Zinfandel and Australian Shiraz. Zinfandel is a nice complementary pairing with its spice and briar notes. French Cote du Rhones and aged Syrahs also work well medium flavoured cigars. With full flavoured cigars I prefer youthful fruit forward reds with loads of fruit and soft tannins. With aged and complex wines veer towards complex lighter cigars. Italian Amarone is another option with full-flavoured cigars just be aware of the tannins of the wine. White wines are the biggest challenges to pairing with cigars. The natural acidity level in whites competes with most cigar flavours and acts as a palate refresher with each sip. Sauvignon Blanc, Chablis, and Pinot Gris are not great matches. 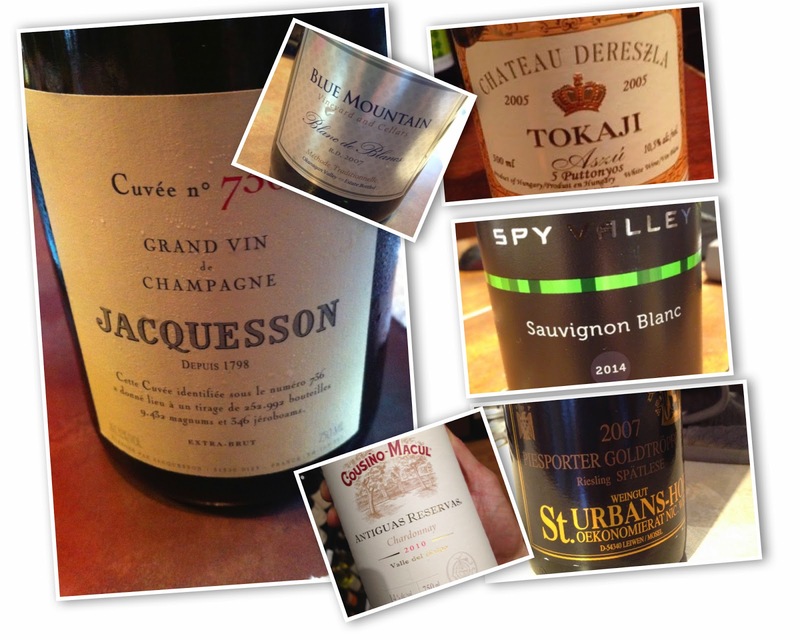 Bold Chardonnay based Champagne and sparkling wine is a good bet all cigars. The autolysis notes of bread, yeast, and cream are pleasant cigar partners. White friendly cigar wines are those with some oak treatment and/or malolactic influences i.e. many new world Chardonnays. Riesling, especially when off-dry, works well with many cigars as the riper fruit flavours intermingle with the floral and woody notes. A stunning match with cigars also includes dessert wines including botrytis heavy Sauternes and those made from Furmint. Try a Hungarian Tokaji Aszu 5 Puttonyos with a full-flavoured or maduro cigar, a heavenly mix of honeyed fruit, smoke, and unctuousness. With white wines contrasting matches seem to be the best matches. Give a table wine and a cigar a try... you may be pleasantly surprised.